This is the sixth installment of my column on training that appeared in January 2000 issue of TaeKwonDo Times. Read the previous installment here. 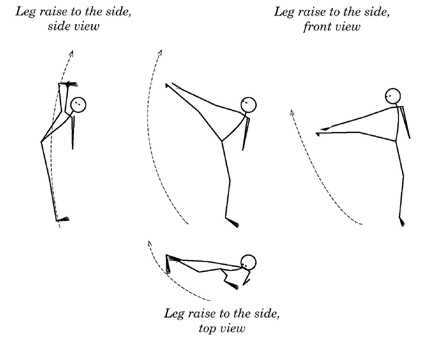 Apart from the right way of developing your flexibility  meaning doing the right stretches at the right time, to throw high kicks without any warm-upyou need to know and practice the right technique of kicking, including the right body alignment. In this article you will learn the correct body alignment for the high side kick. The high roundhouse kick I will discuss in the next article. When I took up karate in Poland, at the age of 20, it was obvious to me that if some people had to prepare, stretch, and loosen up before kicking, then there was something wrong with them or with their kicks. Luckily I met Mac Mierzejewski, the author of Power High Kicks with No Warm-Up!, a knock-down karate fighter and instructor who also studied at AWF. He was less flexible than me, but he could throw any kick higher than I could, with knockout power, and without any prestretching. During our individual workouts he taught me how to align the body for great height and power in the kicks without having to reach the limits of one's range of motion in the hip joints. He had to show me the little details of kicking techniques that let you kick high and with power without warm-up! As a bonus, these same little details reduce your chance of injury. Yes, you can learn how to throw high kicks cold without injuring yourself, pulling muscles, or even getting sore. All you need to do is to learn (and practice!) the right body alignment to make sure your hips and knees don't hurt when you throw high side and roundhouse kicks. I will use the example of a raising side kick (yoko keage in karate), a kick that should be learned before learning the high thrust side kick (yoko geri kekomi, in karate, yop-chagi in taekwondo), to show how small adjustments of your position can increase its height. When learning the raising side kick, you should start with the leg raise to the side shown in the previous (fifth) article of this column in TaeKwonDo Times November 1999. This exercise (leg raise to the side) will eventually allow you to reach a higher side kick. Many people experience quite a bit of discomfort, even pain, in attempting this dynamic stretch. They can only raise each leg to about 45 degrees (and it hurts doing that). Their problem? They try to keep their leg straight, and to raise it straight sideways while attempting to keep their whole body straight too. This is typically the cause of difficulties and hip pain among beginners attempting this kick. Those who are not shown this leg raise or raising side kick in its combat application tend to do it this way. To dramatically increase the height of the raising side kick, you need to tilt your pelvis forward as you raise your leg sideways. To learn its proper form do this: Stand with your feet together, extend your right arm to the side, hand at your hip level, palm down. Slightly bend your right leg in the hip and knee joints. Form your foot correctly (knife foot, sokuto in karate, balnal in taekwondo) for the side kick. Raise the right leg such that you kick your palm with the side of your foot. Start from hip level, and gradually increase the height of your kicks. Make sure that you lean forward and your knee is slightly bent, and that it raises ahead of your foot. Kicking your palm forces you to align your trunk, pelvis, and thigh just right for the greatest range of motion in your hip joints. Note especially the amount and direction of the forward lean in the drawings below. Another purpose of kicking your palm is to keep this dynamic stretch from turning into a ballistic, uncontrolled stretch and to prevent overstretching. By the way, the cause of the pain and the limitation of the movement sideways in both the raising side kick and the side split is the same. It is caused by spreading (abducting) the thighs without tilting the pelvis forward. The cure for the pain on the outside of the hip is to tilt the pelvis forward (which is the same as flexing the hips) while attempting the side kick or side split. The alignment of hip, thigh, lower leg, and foot in a raising side kick should be the same as shown in a side view of the horse-riding stance (see the second article of this column in TaeKwonDo Times May 1999). Children below age 11 do not experience this limitation of movement because the angle that the necks of their thigh bones make with their hip bones is different than in adults. In children, the neck of the thigh bone goes more sharply down and slightly forward. This makes the neck of the thigh contact the upper edge of the hip socket at a greater range of abduction than in adults and keeps the trochanter away from the hipbone so it does not restrict motion as much as for adults. As the children grow, that angle gradually changes. The neck of the thigh becomes closer to a horizontal plane and rotates more forward. These changes reduce the abduction of the thigh, as well as the outside rotation of the thigh (also known as turn-out or first position in ballet). Around age 11, that angle gets set. I explain how the outside rotation relates to a side split on page 17 of Stretching Scientifically. Read the next installment of this column here. Draeger, D. F. 1974. Modern Bujutsu & Budo. New York, NY: Weatherhill. Kurtz, T. 1994. Stretching Scientifically: A Guide to Flexibility Training. Island Pond, VT: Stadion Publishing Co. Inc.
Mierzejewski, M. 1996. Power High Kicks with No Warm-Up! Island Pond, VT: Stadion Publishing Co. Inc.